Although this section is written for our patients, we appreciate that those considering surgery for their hyperhidrosis want to be as informed as possible before deciding whether to proceed. We, therefore, encourage you to visit our Physician Portal for a more detailed discussion on sympathectomy for Hyperhidrosis. At Osler, the diagnosis of hyperhidrosis is not made using a specific diagnostic test. Instead, we subjectively assess your history. If you experience sudden triggering of sweat in your hands (palmar), underarms (axillary), or feet (plantar), which cannot be controlled, and impacts the quality of your life, you can be diagnosed as having focal hyperhidrosis. 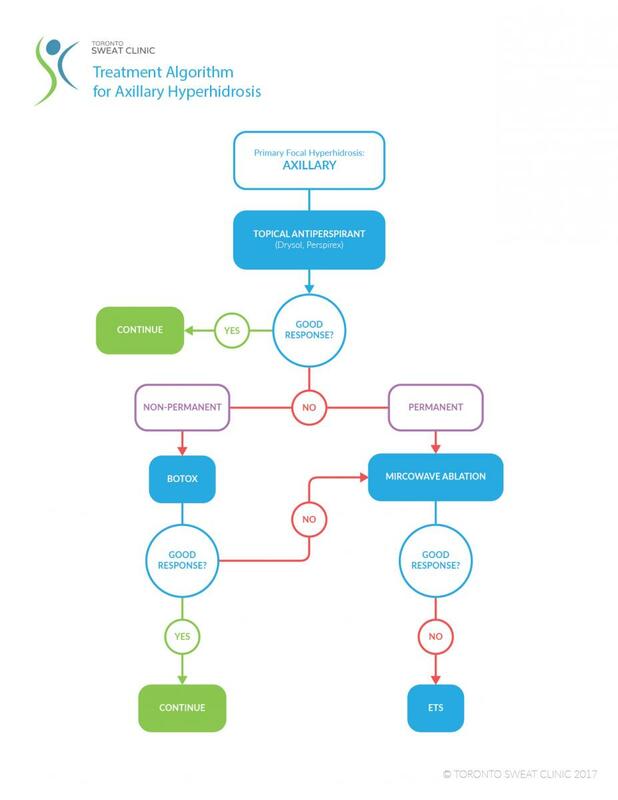 It is critical to differentiate focal from generalized hypherhidrosis, as the treatment algorithm used in your treatment depends on this distinction. Typically, we consider surgery to correct focal hyperhidrosis only in patients with a score of 3 or 4. We have seen a strong family link for hyperhidrosis, which suggests that at least part of the cause of hyperhidrosis is genetic. In fact, at Osler, we have operated on many children brought to our clinic by parents who have endured disabling symptoms themselves. The pathophysiology is not fully understood, however, the cause may be a malfunction in how your nervous system regulates your sweating. There are two types of sweat glands: apocrine glands that produce the odor, and eccrine which are more common and are responsible for thermal regulation. Eccrine glands are most dense in the palmar, axillary, and plantar areas. Evaporation from the sweat is the most effective way to dissipate heat produced by the body and is therefore our body’s best way to maintain its temperature. Focal hyperhidrosis is a major clinical problem, affecting more than 4% of the population. Below are some key points to guide you when treating this very challenging problem. Most commonly affects the hands, underarms and feet. Frequently starts before the age of 25 and demonstrates a genetic predisposition. Often results in patients choosing careers in which they do not have to interact with people, shake hands, or give presentations. Can lead to emotional problems, including depression, poor self-esteem and social isolation. Is frequently called “The Silent Handicap”, as many patients suffer for years without seeking professional help. Can be controlled with non-medically supervised treatments like topical antiperspirants and iontophoresis in mild cases. Medically supervised treatment options include miraDry® ( (Microwave Therapy), Endoscopic Thoracic Sympathectomy (ETS) and Botulim Toxin injections. 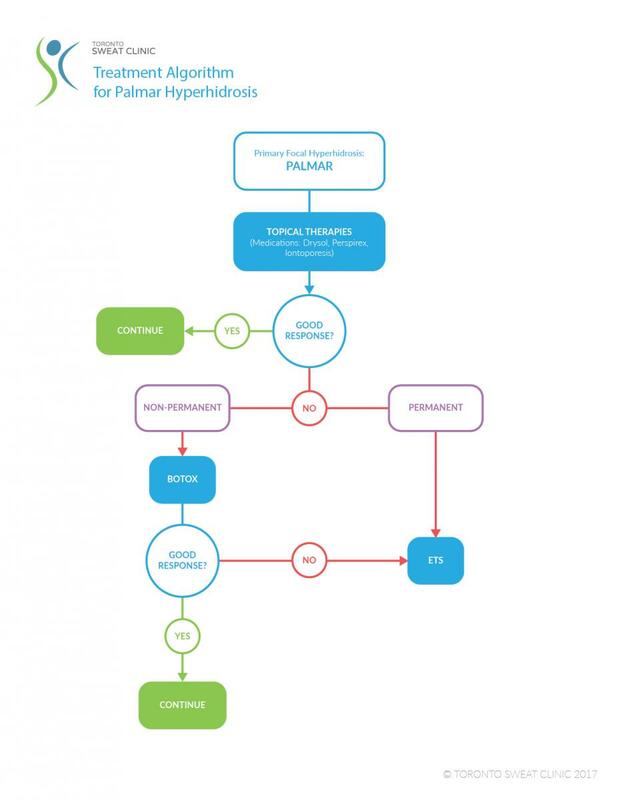 At Osler, we use and have recently published the following Treatment Algorithms to determine the appropriate treatment for palmar (hand) and axillary (armpit) sweating. Within your chest, a structure called the sympathetic nerve chain runs up and down along your ribs. It is the part of the nervous system responsible for the fight or flight response. During a sympathectomy, a surgeon cuts or clamps this nerve chain. This keeps nerve signals from passing through it. Endoscopic Thoracic Sympathectomy (ETS) is an outpatient procedure that can block the vicious cycle of nerve impulses that stimulate the sweat glands in your hands and underarm. When you think about sweating, a sequence of events leads to the sympathetic nerve firing without your control. By removing a segment of that nerve, this cycle is blocked! Two 5-mm incisions are made in the underarm area allowing doctors to clearly visualize the offending nerve. The nerve is either clipped or cauterized. Patients are discharged from the hospital 2-3 hours after the procedure, and the results are immediate and likely permanent. How Effective is Sympathectomy in Reducing Sweat? Can Sympathectomy be Used to Treat Other Conditions? This procedure is most frequently used to treat hyperhidrosis. It's also used for refractory facial blushing, and occasionally for Raynaud phenomenon — a condition that leads to profound sensitivity to cold temperatures and color changes of the skin. After a sympathectomy, the brain can't send signals to the involved areas to make them sweat, blush, or react to the cold as much as they previously had. I am Interested in learning more. What are my next steps? 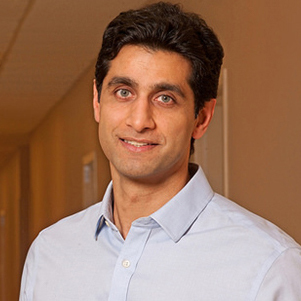 If you feel you are a candidate for ETS, you would need a referral to see one of our surgeons. We have a referral form that you can take to your family doctor. Our team of Thoracic Surgeons have performed over 1000 Sympathectomies. With this experience, we would be able to suggest to you whether an ETS would help your symptoms. Your surgeon will do this surgery using a special video camera. This type of surgery is called video-assisted thoracic surgery (VATS). During VATS, the surgeon makes 2 small incisions (cuts) on the side of your chest. He/she uses a small camera during the procedure to help see inside your body during the surgery. The camera sends the video image to a screen. Using this high definition and magnified view, the surgeon identifies the sympathetic nerve that runs parallel to the spine. The nerve is small (usually 2-3 mm), and consistently in this location. It is away from other critical structures. The surgeon will cauterize(burn) the nerve or place clips on it. When complete, the camera is removed, and the incisions are closed. For a more detailed approach to ETS, please visit our physician portal. No specific preparation is required on your part before your ETS. If you are generally healthy, there is no extensive testing required before your surgery. Your physician will perform a complete overall health exam, which may include having bloodwork done. All patients will meet with a surgeon before ETS surgery. During this meeting, the surgeon will review your records and discuss the sympathectomy procedure. Please bring a list of all medications to your appointment before surgery. You will be given specific instructions on which medications to stop prior to your surgery, and you will meet with our Thoracic Care Coordinator, who will help you choose a date for your procedure. The procedure is performed under a general anesthesia, so patients are completely asleep. Therefore, patients do not have any pain during the procedure or any recollection of the procedure. On average, an ETS takes 15-20 minutes. You will have two incisions on each side of the chest, all measuring 3 mm. On each side there is an incision in the axillary hair line, and a second in the skin crease under the pectoral muscle. These incisions will create small scars however the surgeon will place them in the natural skin creases to ensure that they are barely noticeable. Although ETS is a minimally invasive procedure, there is some pain associated with it. Typically this is localized to the site of the incisions or to the nerves adjacent to the incisions and resolves within days of surgery. There is also some generalized chest discomfort that resolves in a day or two. Occasionally the pain may last longer. The pain is commonly described and central chest pain made worse with deep breaths, and/or “sunburn” type pain in the upper middle back. As the sympathetic nerve is in the chest cavity, behind the lung, we introduce air into this area to allow us to clearly visualize the nerve. This results in a temporary collapse of the lung. The lung is reinflated within a few seconds prior to the completion of the procedure. If the nerve is clipped then there is a theoretical chance that, by removing the clip, symptoms would return back to baseline. However the literature suggests that if the reversal is done more that 2 months following the procedure, symptoms will not revert. If the nerve is cut, reversing the procedure is more challenging. A nerve graft would have to be used to reconnect the cut ends. Although this sounds simple, it is very challenging and still considered experimental. ETS is performed on both adult and pediatric patients. As long as the patient is able to make an informed decision and be in good general health, they are a candidate for the surgery. Drysol, aluminum hydrochloride, is the most commonly used. We recommend all patients try a topical lotion before considering ETS. Many have raised concerns surrounding aluminum toxicity when using these types of lotions. However, as of yet, there are no known clinical studies which measure toxicity after long-term use of these compounds. We have seen mixed results with Drysol, as many patients complain of irritated and itchy skin. Applying the product at night is recommened. Although tHealth Canada has approved the use of BOTOX® for axillary sweating or excessive sweating under the arms, it has not been approved for the treatment of sweaty palms or feet (Hyperhidrosis). The injection carry minimal risk, however the effects only last 4-6 months. The procedure would need to be repeated frequently and can therefore be very costly. Anti Cholinergic Agents like Glycopyrolate can reduce total body sweating.These medications work by inhibiting a certain neurotransmitter (a chemical substance) that stimulate sweat production. AVERT is the trade name of this medication and a prescription is required. Success is very limited and some patients discontinue use due to side effects such as dry mouth, dry eye and blurry vision. Ditropan (Oxybutynin) antoher anti-cholinergic medication, can also be considered. As long as the patient reports improvement without any side effects like blurry vision, dry mouth, or memory loss, they can continue using Ditropan. Iontophoresis involves placing the hands or feet into a tub of electrified water. The current reduces sweat output in the exposed skin. It can reduce excessive sweating in the hands or feet however requires 3-5 treatments a week to maintain results. What are the potential side-effects of ETS? Compensatory Hypherhidrosis: the majority of patients will experience some compensatory hyperhidrosis. Patients will typically have sweating in the lower abdomen and back. In the majority of patients, compensatory sweating is mild, well-tolerated and an acceptable alternative to severe palmar or axillary sweating. Patients Patients who experience excessive sweating over their entire body before ETS tend to have more severe compensatory sweating. It is therefore our practice to recommend a non-surgical treatment for those with excessive sweating that includes the trunk, legs, or scalp. Surgeon at William Osler have adopted a new technique, where the sympathetic nerve is ablated 2 levels lower than it used to be in the past. This has resulted in a significant reduction I the incidence and severity of compensatory hypherhidrosis. Gustatory Hyperhidrosis: Gustatory sweating is a rare side effect of sympathectomy. Patients who experience this will notice increased sweating in the upper lip when eating certain hot or spicey foods. The reported incidence is less than 0.5% of patients having this procedure. Cardiovascular Symptoms: The sympathetic nervous system has a role in controlling the heart rate. There have been some reports in the literature about the effects of ETS on heart rate and the response of the heart to exercise. However, there is no reliable data that has conclusively shown a relationship between ETS and cardiac function. Am I asleep for the procedure and how long does the procedure take? How many incisions am I going to have and will the scars show? How much time do I need to take off from school/work? Will my sweating come back? Do you have to collapse my lung to do the procedure? Are there any age restrictions for ETS? We ask all our patients to fast starting at midnight the night before your surgery. This is to ensure that you do not develop any nausea or vomiting when the anesthetic is given. You should arrive at “Day Surgery Registration” 2 hours prior to your scheduled surgery time. During this time, some paperwork will be completed and you will be prepped for the procedure. Day Surgery Registration in on the second floor of the South Building. Take the elevator next to the Emergency Room Tim Horton’s. After registration you will be guided by a nurse to the waiting area. We will take care of the rest. You will wake up in the Post Anesthetic Care Unit (PACU) and will likely stay there for about 30 minutes. You will then be taken to the Day Surgery Discharge Unit area where a nurse will provide you with some instructions and a prescription for pain medication. You will be able to see your family or friends in this area. You can get up and walk around once you are fully awake. You will be able to eat and drink once you are fully awake. Most patients go home a few hours after the surgery. Rarely, you may need to be observed overnight in the hospital. This is required in about 2% of patients and is often because the surgeon encountered significant scarring in the surgical area. If you stay overnight, your surgeon will se you the next morning and likely discharge you. Before coming to the hospital, plan to have someone pick you up when you are ready to go home after surgery. If you do not have someone picking you up after surgery, we may have to reschedule. After an anesthetic, it is unsafe to drive yourself home! We recommend that patients refrain from vigorous activity for 2-3 days following sympathectomy. After this we suggest listening to you body: if you have pain during some activities, its your body’s way of telling you to reduce the intensity. However, it is unlikely that anything “damaging” can happen if you overdo it. Let the water run over your incisions. Pat the incisions dry with a towel. Most people are able to return to work in 4-5 days. Depending on your job, you may need to be off longer. Ask your surgeon when it's safe for you to return to work. Do not drive until you stop taking your pain medicine. The pain medicine you are taking may make you drowsy and unable to react appropriately. You must be able to comfortably move your arms and legs before you can safely steer a car. You may lift up to 5 kilograms (10 pounds). Lifting more than this may open your incisions while it is healing. Your surgeon will let you know when you can start doing your everyday activities. We recommend waiting 3-4 days before boarding a plane. As the surgeon puts air into the chest, any residual air can expand at high altitudes causing pain and shortness of breath. Please check with your surgeon if you need to travel right after your surgery. Although significant complications after sympathectomy is rare, if you have any concerns please contact the Thoracic Surgery Office. If you cannot reach us there, please go to your nearest Emergency Room. How Do I Care For My Incisions? Your surgeon will use dissolvable stitches to close the incision. This means the stitches will go away on their own. There is no need to have them removed by your family doctor. You don’t have to cover your incisions. If your clothes are rubbing on your incisions, you can cover them with clean gauze. Do not put lotions or creams on your incisions until they are completely healed. There may be a bump along the incisions. It will get smaller in 4 to 6 weeks. This is called a “healing ridge” and is normal. The area around your incisions may feel numb. This is normal. Normally this goes away after surgery. For some people it may last for several months or may not go away at all. The numbness may be worse on cold or wet days. It usually gets better with time. The numbness may occasionally extend to the front of your chest. This is also temporary. We will work with you to manage your pain. Once discharged the nurse will give you a prescription for pain medication. A typical pain regimen includes a mild narcotic and an anti-inflammatory, like Advil. Most patients require a narcotic for 3-4 days and can then rely solely on the anti-inflammatory. Most of your pain should be gone by 3 weeks after your surgery. Drink plenty of fluids (about 6 cups a day unless your doctor gives you different instructions). Add bran, high fiber breads and cereals, berries, or prune juice to your diet. Take a stool softener, if prescribed by your doctor. If you still have problems, see your family doctor. When booking your initial surgery, we suggest also scheduling your follow-up visit. Preferably we would like to see our patients 3-4 weeks after surgery. As many of our patients are from out of town, we could arrange and phone follow up. If you don't have an appointment for a follow up before you leave the hospital, call your surgeon's office the first week you are home. “The sweaty, clammy, and sometimes dripping hand! For the past 10 years, I have been doing endoscopic thoracic sympathectomy (ETS) for many patients with these symptoms. Many come to the office with a handkerchief in each hand, just to absorb all the sweat. When I welcome them into my office they avoid shaking my hand, and when I ask them to fill out some paperwork they leave the paper wrinkled and sometimes saturated with their sweat. The impact of palmar hyperhidrosis can only be appreciated by those who suffer from it, but after many years of caring for these patients I understand how disabling it can be! Embarrassment, social isolation, low self esteem can result from poorly controlled hyperhidrosis. Many reject great career opportunities, while others shy away from intimate relationships. As a thoracic surgeon I spend a good part of my week treating cancers of the lung and esophagus. I take many to the operating room and perform complex resections that can take many hours. Interestingly, those I operate on for hyperhidrosis seem to be more thankful and appreciative than those I cure of cancer. A shocking statement that illustrates the profound and devastating impact hyperhidrosis can have on otherwise well people. When patients peruse the internet, they often read about the harm that ETS can cause. I would agree that, if patients are not properly selected, many will suffer from equally disabling side effects like compensatory hyperhidrosis. However, there are clear guidelines when choosing good candidates for ETS, which, if not followed can result in unhappy, regretful patients. Ideal candidates for ETS are those that have focal sweating in the hands and/or underarms and/or feet. The rest of their body should sweat normally. They should not have any symptoms suggestive of hormonal imbalance like hyperthyroidism. The sweating should be severe, affecting them everyday. It is for this group that ETS can dramatically improve quality of life. Although 50% of patients will still have some form of compensatory sweating, the sweating is likely to be mild and very tolerable. Miramar Labs, the maker of miraDry®, keeps updating us on their study monitoring patients over the years after completing a miraDry® treatment. Three years after treatment, patients still have no sweat glands in the area treated by miraDry®. The diagram below shows the result of a test called a starch iodine test. This test involves placing iodine on the affected area and sprinkling starch over the area. If sweat glands are present, then a dark patch appears, but if the sweat glands are eliminated, then the area will remain clear. As you can see from the diagram, the treated area remains light and clear, indicating no sweat glands in the area. Below we see what your underarm looks like under a microscope. The first slide shows a normal underarm and all of its sweat and odor glands. The next slide shows an underarm shortly after a miraDry® treatment, notice the loss of both the sweat and odor glands. The last slide shows an underarm a few months after treatment, showing no regrowth of the sweat and odor glands. This indicates that once they are eradicated, they are gone for good. 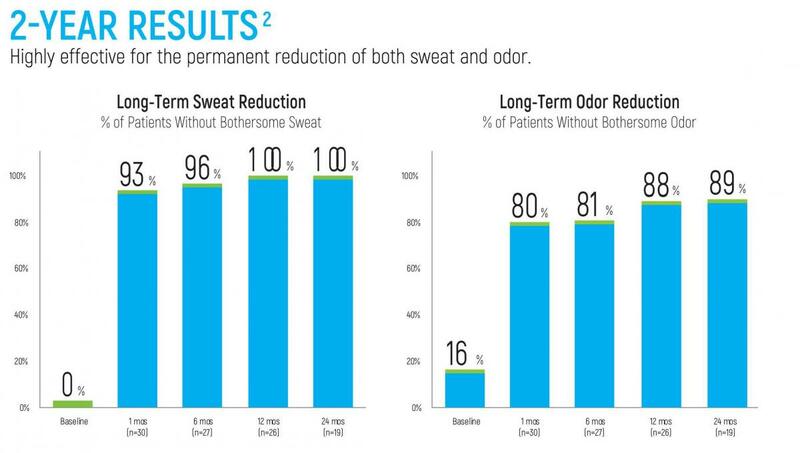 This last diagram proves that miraDry® really works for both sweat and odor. After 2 years of treatment, 100% of patients still state that they are no longer bothered by sweat and 89% of patients are not bothered by odor. What other non-invasive treatment can offer these incredible results?